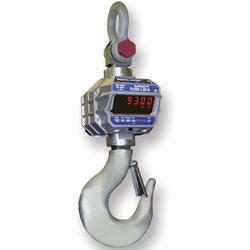 The MSI-9300HT crane scales combine an integrated weight display with advanced wireless data processing capability providing versatile solutions in overhead industrial weighing applications. Both crane scale configurations merge MSI’s advanced CellScale technology with world-renowned crane scale designs providing local and remote control capabilities along with connectivity with plant information systems.. Both models feature industrial-grade, shock-mounted electronics, watertight packaging with large ultra-bright displays readable at distances up to 50 feet (15 m). Integrated CellScale technology offers the ability to effectively monitor and control single or multiple crane scales from multiple locations throughout plant operations. Wireless, real-time transmission of weight and product information can be processed through a system-configured network of CellScale components from distances up to 1000 feet (300 m) with standard antennas. Operating range can be further increased with optional antennas configured with other networked CellScale components. Both fixed and handheld digital weight indicators are available in addition to RF modems for wireless connectivity with peripheral computers and scoreboards. Optional 802.11b/g Ethernet connectivity is also supported for adaptation and integration with existing plant information systems. Please see specifications for other CellScale family components complementing the MSI-9300 and MSI-9300HT, including: MSI-9000, MSI-9020, MSI-9850, MSI-9750A and MSI RF scoreboards. CellScale products provide configurable system solutions to satisfy nearly any wireless weighing application. Optional MSI-9300 Retrofit Kit MSI-9300 Retrofit Kit integrates CellScale™ technology with existing MSI-4300 Port- A-Weigh Plus crane scales. The retrofit kit replaces the existing front and back castings of the MSI-4300. After conversion, the new MSI-9300 adapts easily into any CellScale network.